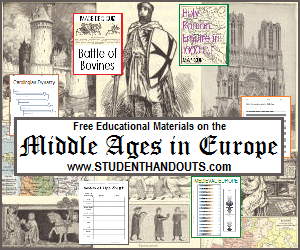 These are our free educational materials focusing on Europe during the medieval period. They are appropriate for grades 7-12 studying World History or European History. If you are looking specifically for items on the Black Plague, click here. For the Crusades, click here. For medieval Islamic conquests, click here.